We changed our Season’s Freshest last week to one of our favorites here at High Rock – Parsnips! Some of you might not be familiar with this particular vegetable, a parsnip is much like a carrot but has a sweeter smoother flavor when cooked. We decided this month to incorporate the sweet taste of this root vegetable into a hummus! We actually use this hummus on both the Reef Raider and in the Asian Hummus. It’s a little sweeter than the regular hummus so it makes it great to pair with savory flavors. For our Asian Hummus we take this parsnip hummus cover it with kim chi and serve it with bell peppers and fried pita wedges. Kim Chi is to the Asia as Sauerkraut is to Germany, it’s a staple that is used frequently. 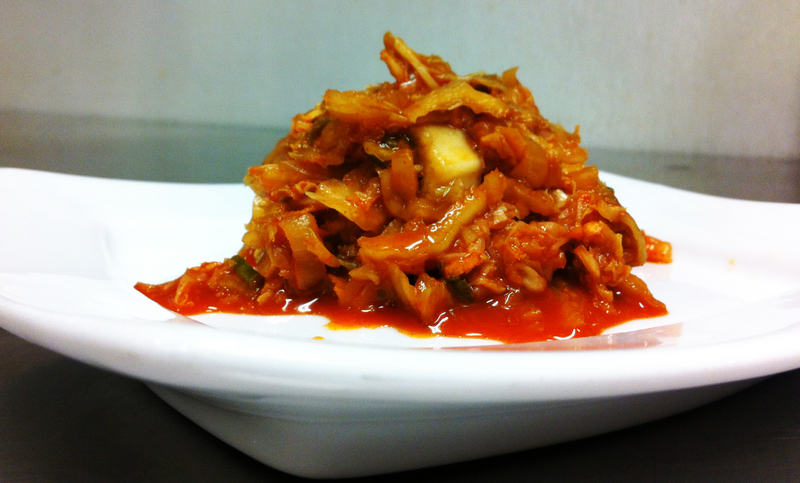 We make our own kim chi at High Rock with is quite a process. First we take cabbage and soak it in salt water for 3 hours, drain and rinse. Then we add fish sauce, spices and green onions, mix together and let it sit in a cool dark place for 24 hours. It’s important not to have any sunlight hit the mixture and away from any heaters, it can be at room temperature though. After that we put it in the fridge 2 days before we using it on our Asian Hummus. So if you want to give it a try this holiday season we will with cheer you on! The next item we have is the Reef Raider Sandwich. 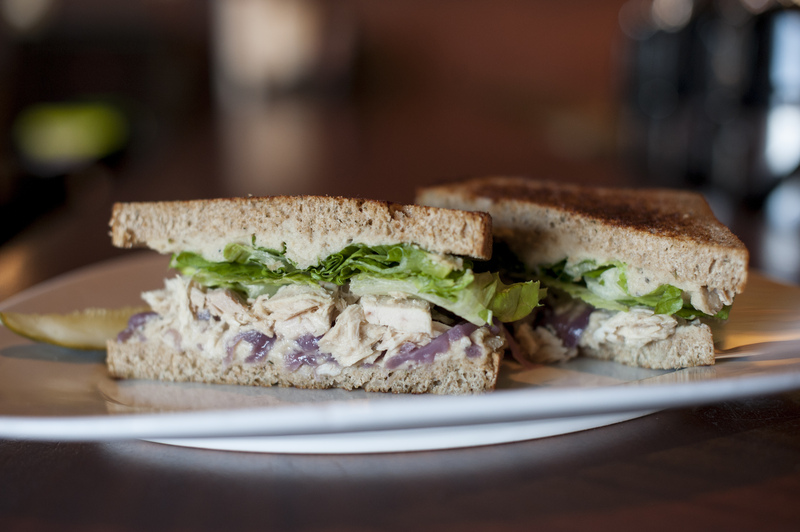 This sandwich is served cold and has our sweet parsnip hummus with big chunks of clean white Tuna. Again we are using “Great Harvest” bread from our local bakery and they were kind enough to make a their Oregon herb onion rye to fit our sandwich. We top it off with sweet onions and romaine to complete this perfect pairing. If you’re really hungry our beef stroganoff might be for you. For the sauce we are borrowing the au jus and horseradish from our Saturday Prime Rib and then adding oven roasted parsnips, carrots, red onion, and spinach. We are serving this with egg noodles and then over the top we sprinkle large crispy parsnips. It’s quite a meal and perfect if you are craving some strog through this wintery weather. The final item is our Parsnip Cupcake. The smooth sweet nature of the parsnips lends itself perfectly to this creation and then with the sweet brownbutter maple frosting, it’s a little piece of heaven! We have a great Season’s Freshest for you this month, APPLES! For starters we have the Wozniak Old Fashioned. This cocktail was a huge hit the day we previewed the menu. If you like ginger ale and apples mixed together you’ll love this. Trivia note, Wozniak is one of the founders of Apple Computers, if you saw the Steve Jobs movie he’s the other guy. Second we have Chicharonnes Nachos. We buy pig skins and dunk them in our deep frier, these are just like the ones you can buy in the store but freshly cooked! We drissel apple butter and barbeque sauce over the whole thing and add some jalapeno bacon (yum!) This would be a perfect snack or appetizer for you and your family. Next is the Harvest Cobb Salad. We loaded it up with everything good, bacon, blue cheese, pecans, a hard boiled egg, dried cranberries and fresh apples. 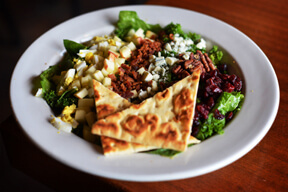 There are so many great items in this salad AND then we top it off with a avocado poppy seed vinaigrette. It’s the perfect amount of creamy and tangy and will send you over the moon! Then we brought back the Monte Cristo, with a twist. We’ve heard how much our regulars have missed this one since we took it off our menu before summer. So come back in and enjoy this version of your favorite. This time we added our house made apple butter on the side, as if it wasn’t good enough. Also the bread we are using if from the FANTASTIC Great Harvest bakery. This locally owned and operated bakery (but part of the Great Harvest chain) is so good. The only activity we like better than making great food is supporting our local businesses and Great Harvest allows us to do both! Visit them in person or on facebook to see how great they are. Finally we have the Batali Pasta. We are sticking with the cavatappi pasta for this one and adding Italian sausage, kale, garlic and onions. Where are the apples? Well we cover it with breaded deep fried apples (which could amazing all on their own) and douse it in an apple cream. Sweet and savory, can’t beat that! So come on in and give it a try, all at once or bit by bit over the next month. You won’t be sorry!